Is It Time For Tomas Berdych To No Longer Be Owned? There is perhaps no active player who has been as owned by the Big Four as painfully as Tomas Berdych. Poor, big-hitting Tomas Berdych, one of the fixtures of the men’s game, constantly found loitering in the later rounds of the majors, but never winning them. The Czech quasi-star has surged as high as No. 4 in the world, won a bevy of smaller titles, and made at least the quarterfinals of a major 16 times. That’s a whole lot! And 12 of those times, he has had his fun quashed by either Roger Federer, Rafael Nadal, Novak Djokovic, or Andy Murray. One time, at Wimbledon 2010, he even hacked his way to a final—right through Roger and Novak—only for Rafa to polish him off in straight sets once he got there. Dude cannot catch a break. Overall he has a 6-17 record against these four men on the Slam level, and a 133-39 record against everyone else: He wins 77 percent of the time against the masses, and 26 percent of the time against Olympus. In short, Tomas Berdych might have had a major by now if not for the misfortune of being born around the same time as three of the best players ever, and another very good one. When someone says that the Big Four have blotted out entire careers, this is the sort of career to which they refer. But can Berdych do it now? I actually think it might be possible. Coming off a back injury that ended his 2017 season—and, you might have maybe suspected for a very tall 32-year-old, his career as a successful tennis player—the No. 19 seed has played some punishing matches in Australia. Look at his 6-3, 6-3, 6-2 deletion of Juan Martin del Potro in the third round. Having watched both these men play from close distances, I can report that the sounds of their tennis shots are unlike the sounds of any one else’s. They sound like cracked whips, gunshots, beer cans popping open—scary, scary things. The ball, zipping in flat, almost curveless line drives over the net, can scarcely be tracked by the normie eye. But what Delpo can do on only his preferred forehand side, Berdych can do on both wings. A match between these two is bound to be a matchup of pace, but in these rallies, one man looks like he’s bashing fecklessly away at the ball, while the other looks like he’s guiding cruise missiles down the line. His control is almost eerie on some of these, his killing blows catching Delpo absolutely flatfooted. Berdych had 20 aces, and 52 winners to go with a tidy 28 errors. (Take all this with a grain of salt; the stats have been a wreck. The match summary isn’t even consistent with the writeup that sits next to it.) In the fourth round he then cleaned up the roguish shotmaker Fabio Fognini in similarly straightforward fashion, 6-1, 6-4, 6-4. Next he faces Roger Federer. When they met here last year in the third round, Federer disassembled him in 92 minutes. “It’s not so much fun,” said Tomas Berdych, after his brief procedure. 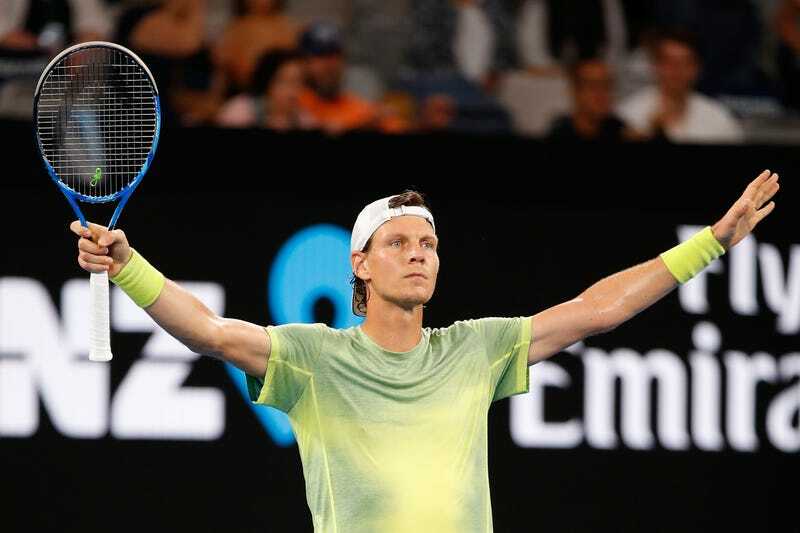 “I would rather be in the stands watching than on the court.” Later that year, in Miami, Berdych had Fed nearly dead, but the Swiss nixed two match points with dastardly aces, wriggled away and won it anyway, as he tends to do. Tonight in his quarterfinal, Berdych will get another look at a foe who has beaten him 19 times in 25 career tries. Federer has yet to lose a set, but he hasn’t exactly been stress-tested. Meanwhile, Rafa has limped out. Cilic already has one of these. The tummy rumbles for a first-time Slam winner. It could be the nice ginger from England with the furious forehand; or the ox-strong Korean kid leading the youth; or the Pizzagate dunce; or Tomas Berdych, who has come close so many times without ever quite making it there.